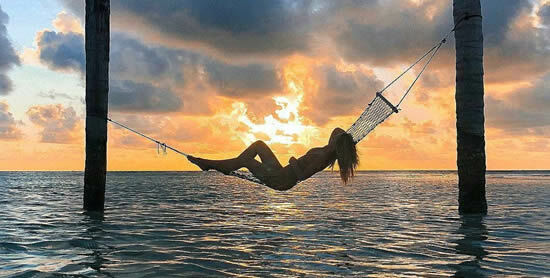 Enjoys beautiful views of the Indian Ocean in the South Malé Atoll, the beaches on Kandooma are poor. And you probably thought that there was no way around this, but the hotel realized its fantasies and showed professionalism so that the solution to the problem turned out to be so successful that you not only did not notice this shortcoming, but also enjoyed it during your holiday at Holiday Inn Resort Kandooma Maldives. Set on a beautiful, palm-fringed island in the South Male Atoll, from the moment you check into one of the resort’s laid-back beach villas, your break is sure to be packed with private beach relaxation, sensuous spa treatments and all the sun-filled fun you could ever want. Whether you’re an active adventurer yourself, or just fancy letting the kids go wild with a complimentary snorkelling session – dive, surf, fun tube or paddleboard, you can do it all at the Holiday Inn Kandooma Maldives. Holiday Inn Resort Kandooma works very well for both families and guests who want to be among like-minded people and love entertainment. Again, because most people socialize in and around the pool, and couples can find their own, private space in the silence of their room. Approximately half of the guests are from Asia and half from Europe. 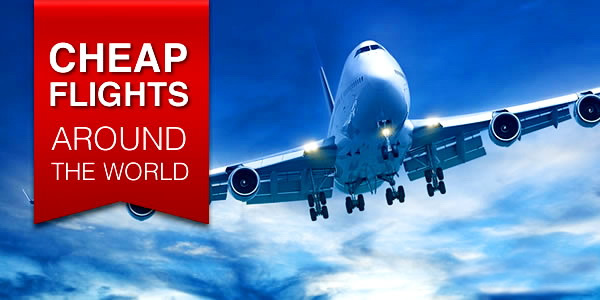 Since the transfer to the hotel is only by boat, it fully satisfies the arrivals and departures from Asia. 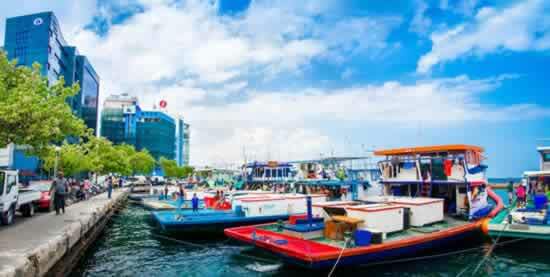 And there is no need to spend the night at the airport or in the capital Malé. Kandooma is the Maldives’ most accessible and budget-friendly resort, and your holiday starts the minute you disembark from the plane. Surrounded by world-class dive sites and surfing spots, Holiday Inn Resort Kandooma lies 40km south of Velana International Airport, Malé and in true tropical paradise fashion. The way to get here is via a 40-minute speedboat ride to the South Malé Atoll. Step off the boat and you’ll find the friendly staff waiting to drive you and your luggage all the way to the reception. At Kandooma, you can start relaxing the moment you set foot on the island. 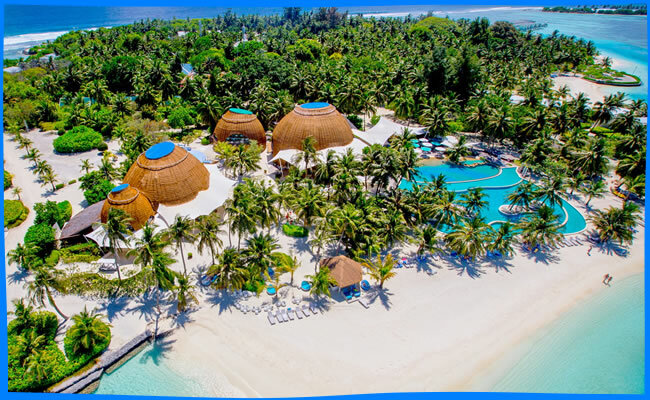 The Holiday Inn Resort Kandooma has 160 rooms, suites and villas in differ categories: Beach View Villas, Sea View Beach House, Beach Houses, Garden View Villas, Family Beach Houses, Island View Overwater Villa and Overwater Villas. Choose from the 8 different room types available - your home away from home in paradise. The design of all the villas used concise clean lines, creating a feeling of freedom and freshness. It is extremely pleasant to walk barefoot on the bleached wood floor with a well-defined texture. Large panoramic windows create the effect of the absence of walls, enhancing the feeling of merging with nature and the endless blue ocean. The rooms are not large, but they are places where you will be happy to stay. Clean rooms are simply amazing, and even lift their spirits with their nautical design, starting right from the coffee table. The lightness of white is enlivened by blotches of bright colors. It’s not just the effect on anyone — a tuned iPod, fresh coffee and a plunger, free brewing, and a strong orange metal juicer with free oranges — all pleasant trifles that really make you feel in your own home by the sea. The low and rectangular Beach Villas and Garden Villas have inadequate magic duplex villas and water bungalows, but offer good value for money. The Overwater Villa offers the ultimate in the Maldives experience. 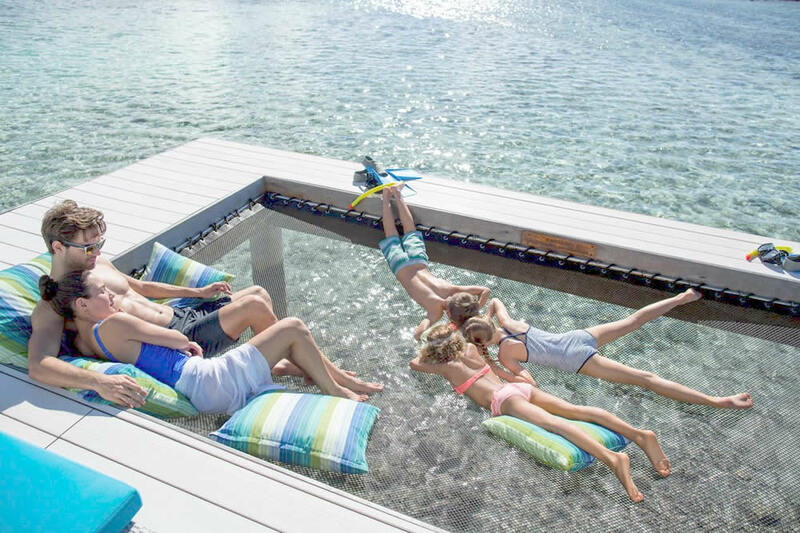 Hovering above coral and marine life in the shallow clear waters, guests will enjoy their time on the private sundeck. For even more luxury, treat yourself to Overwater Pavilion. These villas come furnished with the same luxurious facilities as тхэир сингл-bed counterparts. Room sizes vary from 85 to generous 170 square metre space. The air-conditioned indoor fun zone comprises of 2 fun filled activity levels. Ground level kid zone caters for 4 - 7 year olds and upstairs for 8 - 12 years old. Both levels are colorfully decorated and furnished to capture the children’s imagination and include a library, art & crafts specialty area and interactive gaming room on the upper level and ball pit and craft making on the lower level. Complimented by the Kandoo hosts, they will keep the kids stimulated and entertained with a set of various activities such as henna hand artwork, face painting, cake decorating and kids will be able to design their very own designer Kandoo Kids t-shirt. Kandoo Kids Club also features a crawl and napping area, for those needing that break from all the fun. To cool off, kids can enjoy our very own designer “Splash Pool”, first of its type in the Maldives, features low wading pool, waterslides, water cannons, spray wall and it wouldn’t be the same without the water tipping buckets to keep the kids actively entertained. Open from 8am - 8pm daily, Kandoo Kids Club is free for children between the ages of 4 - 12. Baby-sitting service will be available upon request. 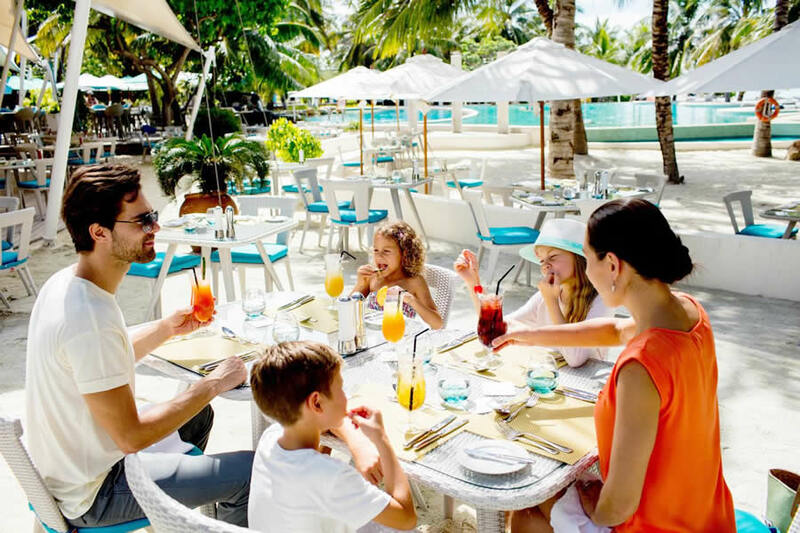 Each week the resort features a Weekly Activity Plan for the children to enjoy various activities throughout their stay: Mini Snorkeling, Indoor Activities, Wet and Splash, Cooking Classes, “Pirates of the Maldives and much more. waves and Radio Kandooma’s breakfast show. Tell our chefs how you’d like your eggs to go with your international breakfast, complete with selection of juices, ground coffee and teas. Come evening, the “Big Barnacle” transforms from bright and breezy to soft and romantic, lit by the intimate glow of candles and buoyed by the chilled beats of music. The Kitchen is another an exquisitely elegant dining experience with the best view of the island. The restaurant offers diners a sublime Modern Fusion menu out on the beach with feet in sand, in upholstered comfort overlooking the Kandooma Channel. Just 15 paces away is the wine room with a choice of 250 different old and new-world wines. Enjoy a little bit of the “city-by-the-beach” at Bokkuraa Coffee Club. Choose from a daily changing rotation of fresh pastries and homemade ice creams to go with boutique coffees and teas freshly brewed to order. Take in the stunning vistas of pool, sea and sky, or catch up on the latest buzz while you wait. perfection by the resident mixologist. Baraveli is the resort's first beach bar located on the beachfront overlooking the beautiful lagoon of the Indian Ocean! Looking for something chill and cool on a sunny day? The bartender is ready to show you what he’s got! Feeling a little bit hungry? No worries, the snack menu is available too to satisfy your palate. The Lounge for prder a cup of coffee or tea and settle back and listen to the diving stories told by the divers who hang out here. Pool Bar is place to grab steaks, pizzas, sandwiches, salads, and your favourite poolside beverages make a compelling case for lounging the day away in the sun. For a long time, Kandooma is known as a diving island, a place that didn’t care too much about luxury, but spent a lot of time diving. The sites that attracted the first divers then are still around, and so many guests come to the Holiday Inn primarily for diving. For beginners, there is a good house reef, and for many experienced divers in abundance there is excellent thilas dives, promising the very best and greatest from the Indian Ocean. 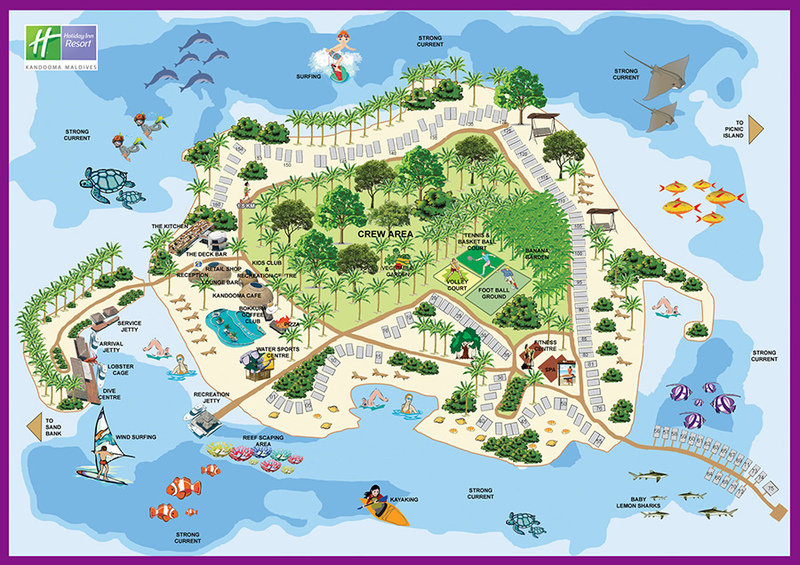 For children 8 years or older to experience scuba diving in the safe, poollike conditions of the confined lagoon area. Cocoa Corner, Kandooma Caves and Kandooma Caves are the most popular dive sites. In recent years, Kandooma has also earned a reputation as a surf spot, because just 50 meters from your villa is a Kandooma Right break, and 30 minutes from the island you can catch another 6 big waves, including Twin Peaks, Tucky Joes and Quarters. With limited numbers at the resort we can now guarantee that all surfers on Kandooma Island will be able to enjoy one of the best right hander’s in The Maldives uncrowded every day. The breaks around Kandooma Resort have something for everyone, from first time beginners on the beach break; to those beginners that want to move to an intermediate level; to experienced surfers looking for fast barrels and rippable walls. The surf instructor is qualified to teach and help progress to non-surfers and surfers of all levels. Full-day surf transfers are a 3-hour trip up to four times daily to any South Male Atolls breaks, with departure times variable depending on the best surfing conditions. The beach does not have direct access to snorkeling and the beach is replete with warning signs of strong currents, but there is a free snorkeling excursion every day is only 5 minutes by boat. Trips to other coral reefs are also on the weekly activity menu. A few places around the island were turned into decent sandy beaches, and this is quite enough, but everywhere, as in the lagoon, you should beware of crisp and sometimes sharp corals under your feet. Finally, Como Shambala Spa is a quality product and the place where you will find relaxation and peace for the mind and body. Treatments, massages, yoga and wellness will help you recharge your life energy, and it is possible to achieve harmony with nature. It offers five beautiful rooms, as well as two luxurious spa villas. This is another aspect of the resort that is a lot to offer away from the beach. This resort at the same time manages to be a place to lie down and relax, or to take part in vigorous activities on the island, taking place all day and in the evening. A sunset cruise is a good example where you can sip a cocktail while sitting on the rooftop while enjoying a game of sunset colors, or flatten yourself like a ramp on a net stretched in water and move along with the boat while continuing to enjoy drinks and wild surf. Returning to the beach, you could participate in a geography quiz, or finally go to bed, right after an early dinner. Reviews of the Holiday Inn Kandooma Resort are generally very positive, with most past guests pointing to a very good experience overall. The staff and the food get very high marks for being even better than expected. The range of facilities and the nightlife also gets positive notices from many. Some guests do point out that the overwater villas are in relatively shallow water so snorkeling below them is impossible, at least during low tide. A few other guests point out small maintenance issues, though with a large and busy resort like this you are bound to have some guests who experience problems, and even the majority of them say they'd come back. Many guests mention that the in-room wi-fi either didn't work or didn't work well, so that could be an issue for some. Overall, this seems like a good resort choice. No house reef in the resort. Snorkelling excursions on offer are expensive and not worth it.